Feva's Battle Knights game puts you in the thick of the action in this exciting, action packed weapons and targets game requiring skill & strategy. The game includes a large battleground game board (89x69cm), a castle strong hold with exploding targets, command tents, palisade defence positions and redoubt trench with exploding trigger spots. Also included are consist detailed miniatures of knights on horseback, generals, soldiers and archers, while the weapons include powerful catapults and combat cannons, which fire the battleballs at the opposing army. What is great about Battle Knights is the fact that this can be enjoyed by both the very young and the very old. The younger players will love watching the castle explode and the older player will love the tactics that need to be used in order to ensure you win. This is like a starter role-play game kit - only much more fun. When I first started playing this I was a little disappointed that there was only one castle. I thought that each player would have their own castle and be forced to defend it, while at the same time attacking their opponent. However, after playing this for the first time, I soon realised that the real fun is being able to spend your entire attention on destroying, or defending the castle. We played this game as a sort of "King of the Castle" i.e. the winner stays as the guardian of the castle. There was something immensely satisfying about dethroning the boss after he had reigned supreme for five games (actually I thing he was cheating and sticky taping his men down). 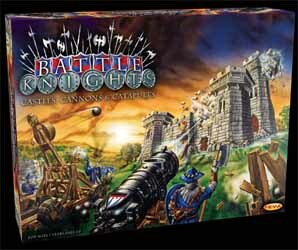 Whether you play by the rules, or just take it in turns firing cannon balls at each other's team, Battle Knights is a great deal of fun. And, at under £25 incredibly cheap.